Albright, R., J. Benthuysen, N. Cantin, K. Caldeira, and K. Anthony, 2015: Coral reef metabolism and carbon chemistry dynamics of a coral reef flat. Geophysical Research Letters, doi:10.1002/2015GL063488. Global carbon emissions continue to acidify the oceans, motivating growing concern for the ability of coral reefs to maintain net positive calcification rates. 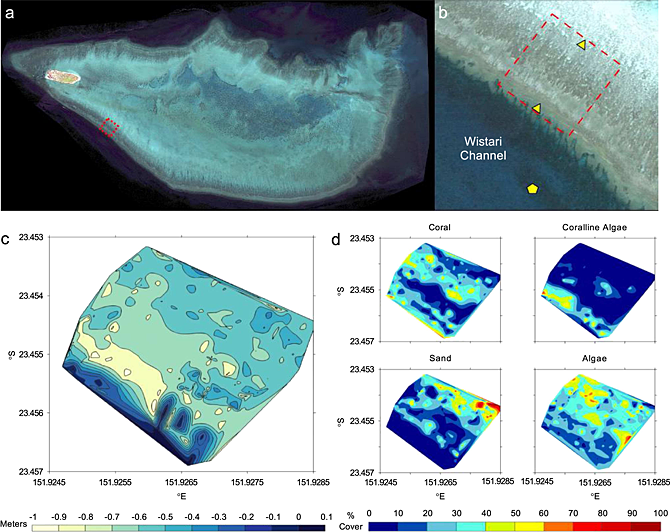 Efforts to develop robust relationships between coral reef calcification and carbonate parameters such as aragonite saturation state (Ωarag) aim to facilitate meaningful predictions of how reef calcification will change in the face of ocean acidification. Here we investigate natural trends in carbonate chemistry of a coral reef flat over diel cycles and relate these trends to benthic carbon fluxes by quantifying net community calcification and net community production. We find that, despite an apparent dependence of calcification on Ωarag seen in a simple pairwise relationship, if the dependence of net calcification on net photosynthesis is accounted for, knowing Ωarag does not add substantial explanatory value. 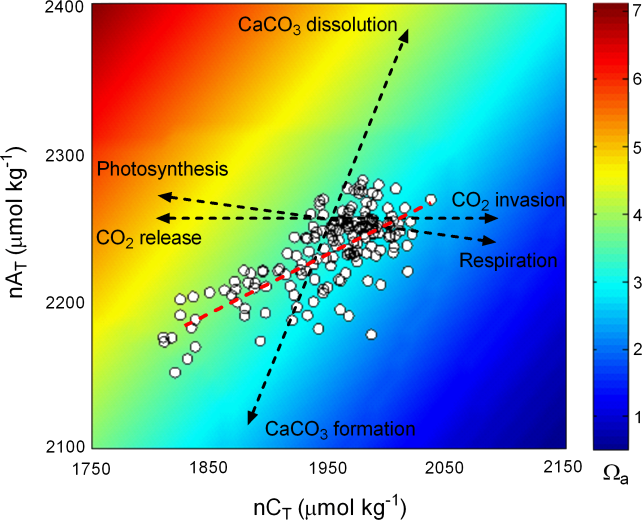 This suggests that, over short time scales, the control of Ωarag on net calcification is weak relative to factors governing net photosynthesis. Figure 1. (a) Quickbird image of Heron Island (23°27′S, 151°55′E) with the study area denoted by a red box. (b) Close-up image of the study area; triangles denote Q6 locations of water samplers, and the star denotes the location of NOAA’s PMEL CO2 buoy, situated in the neighboring Wistari Channel (www.pmel.noaa.gov/co2/ story/Heron+Island). The study area denoted by the red dashed box is approximately 300 m by 300 m. (c) Bathymetric and (d) benthic community composition maps generated for the study site. The bathymetry map was used to calculate depths of Lagrangian transects, and the benthic community composition maps were used to assess the community composition at the study site. Distinct benthic zonation was observed but overall was characterized by (in order of abundance): turf algae (23%), live coral (21%), sand (19%), crustose coralline algae (14%), rubble (8%), dead coral (5%), zooanthids (4%), “other” (invertebrates, sponge, etc., 3%), macroalgae (2%), and cyanobacteria (1%). Figure 2. Composite diel curves for various carbonate chemistry parameters on the Heron Island reef flat. Data points show data collected from two automated water samplers, deployed at the reef crest and back reef/lagoon. Blue lines represent cyclic cubic spline fits of the data, generated using R. The grey band reflects the 1 standard error uncertainty in the fitted mean values. While our data exhibits large interdiel variability, intradiel patterns are well constrained. Figure 4. Property plot of normalized total alkalinity (nAT), normalized dissolved inorganic carbon (nCT), and Ωarag of the Heron Island reef flat at a temperature of 25°C and a salinity of 35. Vectors illustrate the direction of the effects of photosynthesis, respiration, calcification, and dissolution on AT, CT, and Ωarag. Data points show reef flat data collected from the water sampler time series. 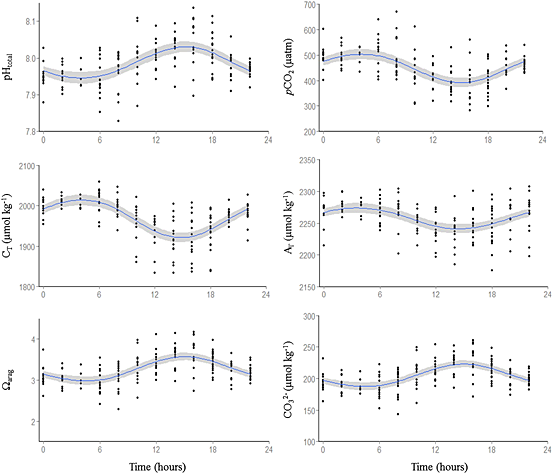 Because photosynthesis‐respiration (ncp) and calcification‐dissolution (ncc) affect AT and CT differently, the slope of the AT‐CT relationship (red dashed line) indicates an average ncp to ncc ratio of 3.4 ± 0.08 (1 SE). Figure 5. Relationships between (a) net community calcification and aragonite saturation state (Ωarag), (b) net community calcification (ncc) and net community production (ncp), and (c) the residuals of the ncc‐ncp relationship plotted against Ωarag. Open circles indicate daytime measurements, and closed circles indicate nighttime measurements. Figure a could be interpreted to indicate that ncc is largely controlled by Ωarag. However, if the relationship between ncp and ncc is taken into account (Figure b), Ωarag does not play a significant role in explaining the residual scatter (Figure c).